Here's the crowd that I have to walk through everyday after my class. We're right next to a fairly large primary school that seems to have a lot of American kids. 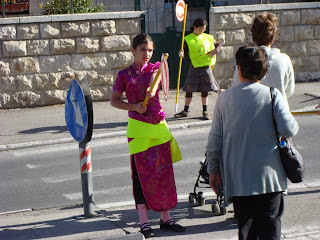 It's a rich neighborhood, so every morning I hear "have a good day" more than anything in Hebrew. 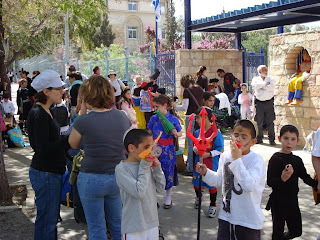 Purim, however, is a dress up day shared by all kids, from those in this picture to the joker in the mouse suit. While walking to class, my friend and I were brushed aside by the cutest little girl in the world. She was dressed up as a ladybug. I was almost thrown into the bushes off the sidewalk as she tore by, excited to show her classmates her outfit. Oh how I miss the days of dressing up as a Teenage Mutant Ninja Turtle.